I love shoes. Who doesn't? Shoes are dependable. They stay by your side through fat and thin. I especially love shoes when they're cheap. Yes, yes we would all love to have a closet full of tributes and louboutins, but face it. Most of us can't afford it. We'd rather pay our monthly rent bill. How sad =( We shouldn't entertain such sad thoughts on a day as beautiful as this one. To perk up all you recessionistas and get the blood pumping through your veins once again, I present to you two of my latest fashion finds! Get that plastic ready cause once I tell you how much I got these for, you wouldn't even bat those pretty eyelashes of yours and think twice. Guess how much? P1299, that's about $29.00!!! How can you go wrong? Pair with rolled up pants a white shirt, pair with cute shorts, a black boyfriend blazer, a sleek black pantsuit, the list goes on and on. You don't have to think much when you have shoes like these. Just keep everything else plain, add some accessories and let these shoes do all the talking for you. Extra Perk? At P1299, they are super comfortable!!! They remind me so much of the new Balenciaga wedges. How much? P1699 or around $38.00!!! Still a steal, sadly they are not as comfortable as the red ones. You have to buy those pads you can attach to the inside of the shoe to protect the back of your ankles. I got a blister the first time I wore it. However, in fairness to the manufacturer of this shoe, I've tried on several pairs in similar styles and that always seems to be the problem. They hurt the back of my ankles, I always end up with blisters. I still love them though and I get to wear them fine now with the addition of those "pads". Break out that plastic without feeling guilty! 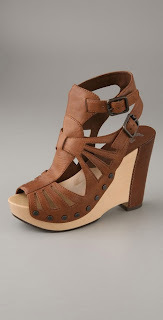 Welcome summer with these FAB shoes!! !